New book, 256 pages with 119 black & white pictures, 81 colour pictures, 7 maps and 45 artworks. 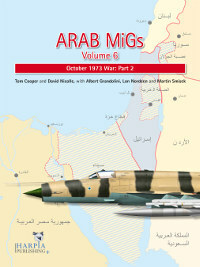 Arab MiGs Volume 6 continues Harpia Publishing’s renowned coverage of air actions by Arab air forces during the October 1973 Arab-Israeli War. After researching in the Middle East for more than 40 years, interviewing and discussing the fighting in detail with pilots, participants and eyewitnesses from almost every unit involved, the authors provide the first ever coherent narrative of this air war. While it has often been argued that air power did not play a dominant role in the conflict, it eventually proved critical to its outcome. Moreover, thousands of combat experiences that were learned during this war - and paid for in blood by both sides - proved extremely influential for the development of new aircraft types and new weapons systems. The October 1973 conflict was one of the best examples of the ever increasing importance of electronic warfare and unmanned aircraft upon the modern-day battlefield, and therefore prompted fundamental changes in the tactics and strategy of the dominant air powers across the globe during the late 20th century. As well as enabling the reader to gain a clear insight into the nature of the air operations by all involved air powers - and the Arab air forces in particular - and the weaponry deployed, this book contains a detailed cross-examination of claims from both sides, analyses aircraft losses on both sides and lays bare the over-claims, regardless of whether officially confirmed. Descriptions based on the reminiscences of veteran aircrews provide an unprecedented insider’s view of key aircraft and operations, illustrating how developments in technology and information warfare added a new dimension to the history of air warfare. Supported by a plethora of background information, more than 300 photographs, colour profiles, maps and diagrams depicting the action, aircraft, camouflage patterns, markings, and weaponry deployed, Arab MiGs Volume 6 is set to become the standard reference work on the subject.